Loaded with fresh peaches and blackberries, this refreshing and healthy Raspberry Salad Recipe (and Dressing) screams "summer". This is a great salad idea to compliment a variety of grilled foods if you are having a barbeque, or will be the perfect nutritious salad for any meal! Not only is the taste fabulous, but even the "look" is amazingly colourful! Truly a feast for the eyes AND the palate! For the salad dressing, in a small bowl, whisk all the above salad dressing ingredients. 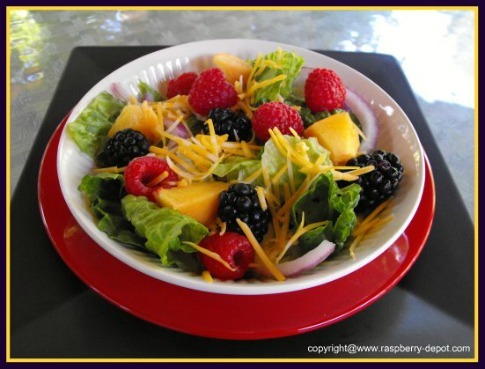 In a large salad bowl, or in 4 individual salad bowls, combine the romaine lettuce, the onion, and the shredded cheese. Add the peaches, the raspberries, and the blackberries. Just before serving add the dressing to the salad bowl(s). Raspberries are very nutritious too, and high in antioxidants, so including this healthy fruit in your diet is a BERRY good idea! Check out all the other amazing Salad Dressing Recipes at this website!